If you are among those who feel that the good old days of rock and roll are no more, with the overall scene shifting more towards metal and other genres, you better think again. In what can best be described as a long awaited gift for rockers and the lovers of rock in the country alike, TNT Records recently brought out the third volume of its Great Eastern Rock audio series. And while the production quality of this compilation has increased manifold since its first volume, the line-up of artistes in the compilation is another reason for fans of rock n roll to cheer! Having personally watched The Great Eastern Rock being conceptualised and take shape right before my eyes a year back, as I sit with the third volume of this audio series in my hands today I can but only marvel at the perseverance and dedication of the guys at TNT. After all, who else will go out of their way into an unknown territory, without sparing any thought for the business angle, to promote the rock bands and artistes of the region? Very few, if not any. But that is exactly what TNT, led by its chief Pradyot Manikya Deb Burman, has successfully accomplished. And while there are many who I remember first ridiculed his decision, I would today go on record to say that as long as there are promoters like him around, rock and roll can never die. At least in the Northeast, that is! Besides being the last surviving descendents of one of the oldest living dynasties of the world, King Pradyot also dons another crown – that of a rock and roll promoter. As far as my memory goes, no other dynastic ruler in the country and in this part of the world has promoted rock musicians and artistes the manner in which he has. Talking about the Great Eastern Rock Vol 3, he says, “The series was inspired when I first got hold of a compilation cassette in the 90s. I was so inspired that I remember installing a car stereo in my Fiat just so that I could listen to these rocking souls throughout the day. But over the years, I have personally seen the platform for local artistes diminishing. It appears that if you do not have the “right contacts” the rock industry deserts you. When we first started, many proclaimed that we were on our way to disaster. But nothing gives me more satisfaction to say that today the third volume in this series is being distributed all over the country and people in places like Delhi and Bangalore being able to listen to our bands.” Talk about “rock and roll” seeing one through. Moving on to the album now. 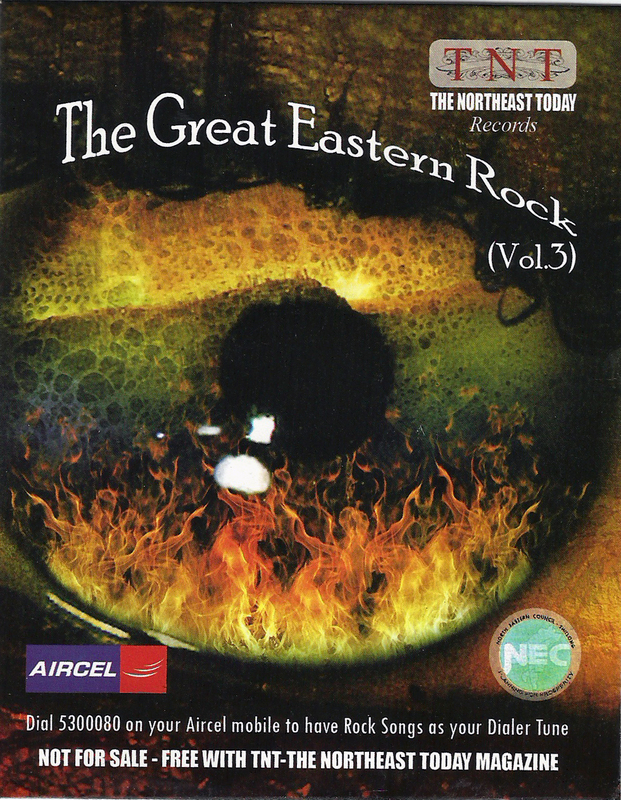 Some of the best bands of Northeast India, a few lesser known artistes and a few hitherto unknown musicians and bands – that is the third volume of Great Eastern Rock for you. For me personally, it was a revelation in itself to hear splendidly recorded tracks by rock and roll bands from totally unexpected places like Bodoland and Agartala! I’m sure that their very inclusion in this compilation will prove to be a big morale booster for these bands and encourage them to tread greater heights; something which all artistes, irrespective of the art form, desperately require. The compilation lives up to its slogan, ‘Rock and Roll never dies’, throughout all the tracks. The pace for the same is set right from the first track itself; the album begins with Mizo band Magdalene’s hit track, Place of an angel, which is characteristic of the rock and roll sound of the 80s. It is followed by the Lwihir Project from Bodoland with the track, Jwngni Bodoland, which was surprisingly pleasant listening. Hornbill National Rock contest 2010 winner OFF, Divine Connection, Melodrama, Girish Pradhan and the Chronicles, The Scavenger Project, Eye to Eye, Lucid Recess, Prayag are some of the established bands whose tracks have been included in the compilation. The album also features lesser known bands like Dabanol, Phoenix, Trini D, Myst, The Lost Tribe, Twijlang, amongst others. All in all, this album made my day. Am sure it will make yours too! Popular Naga rock band Abiogenesis recently released its third album of Howey music, Slice of Heaven, with ten new tracks. The album, which has been recorded at SoulSpeak Studios, has been released through APH Records and it’s collaborating international Music Labels and marketing companies like Create Space, CD Baby, Amazon, Apple itunes, Napsters, Equal Dreams, Songstall, etc. With their previous two albums having received a lot of acclaim, Abiogenesis had gone all out to promote their album worldwide this time. Slice of Heaven is being promoted by the band’s representatives like Big Noise in USA and Night Owl Management in Sweden. “Big Noise is an award-winning Independent A&R Firm specializing in Artist Development and Music Promotion & Publicity,” said Moa Subong, frontman of the outfit. Slice of Heaven has Arenla on vocals and bamhum, Moa on Guitar, Bamhum and Harmonca, Imli on Drums, Larry on Bass and Daniel on Lead Guitar and Jews Harp – a line-up that the band has been maintaining consistently for quite some time now. 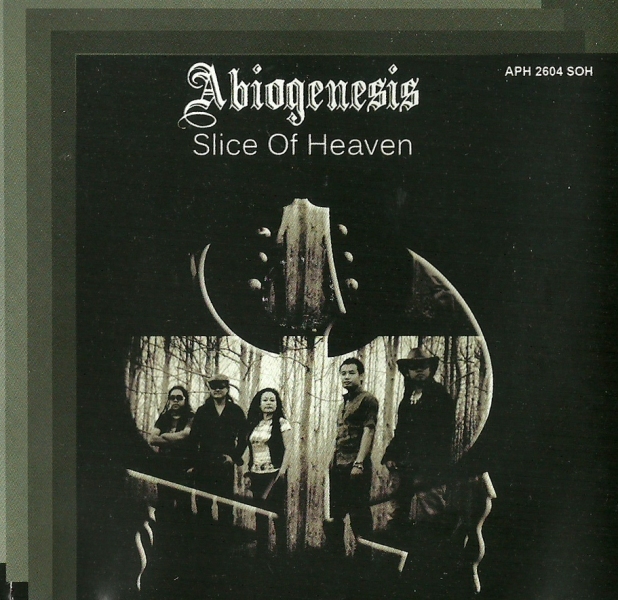 But unlike Abiogenesis’s previous two albums, Slice of Heaven deviates from the melodic rock sound that had somewhat become the trademark sound of the outfit. Though the new album is also rock-based, a lot of experimentation can be noticed that goes on to give a new genre bending aspect to their sound. 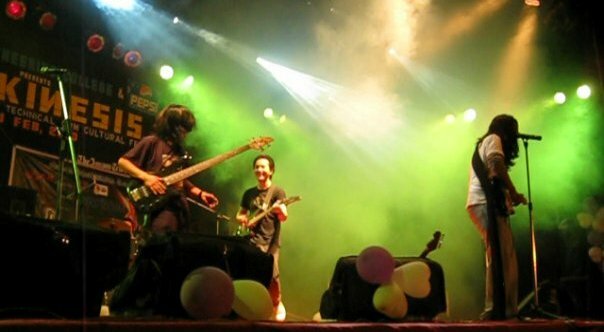 Abiogenesis, formed by Moa Subong and his wife Arenla in 1992, is a five-piece experimental rock outfit from Nagaland , which has created an entirely new world genre of culturally identifiable music by distinctively mixing traditional, folk and rustic elements with contemporary sounds. Their efforts towards the fusion of Naga folk with Western rock is called Howey music, which is defined by its shrill wails. And to aid them in establishing Howey music is the bamhum – a wind instrument made of bamboo. The band has been a lot in the news in the recent past, primarily because of two of its albums of Howey music having being listed for the Grammy awards for two consecutive years – a feat of sorts for any musical group from the Northeast. In an memorable evening of music organized at Rabindra Bhavan last week, a host of renowned singers of the State paid homage to two towering personalities of the music world of Assam. The musical evening, aptly titled Smritir Ekhila Paat, was organized to facilitate an interaction among members of the music fraternity and the public with Dr. Lakshahira Das and Dipali Borthakur, and also to felicitate the legendary duo. The event was organized by Nemcare hospitals. A number of prominent and illustrious personalities of the Assamese music world descended at Rabindra Bhavan that day to pay due cognizance to the contributions of the two celebrated Assamese artistes and also to celebrate their music. The evening saw some of the most popular and evergreen songs of the two singers being brought to life once again at the hands of a number of renowned artistes of Assam. The list of artistes who performed included the likes of Pulak Banerjee, Sangeeta Borthakur, Sangita Kakoti, Pahari Das, Dr. Ananjyoti Choudhury, Dr. Hitesh Barman, amongst others. Internationally-acclaimed ghazal singer Anirban Das, who is also the son of Dr. Lakshahira Das, was also among the performing artistes. 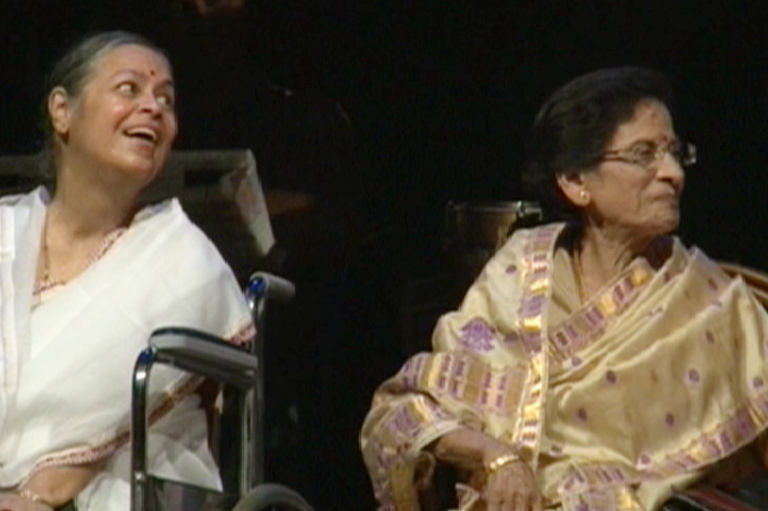 While the performing artistes, with their rendition of some evergreen numbers, ensured that all those present in Rabindra Bhavan that evening were transported down memory lane, the audience was kept spellbound when Dr. Lakshahira Das, on request, sang one of her most popular numbers, Dhul Bai Kot Ratanpurot. The function was earlier inaugurated with the lighting of the ceremonial lamp and the offering of tributes to PJ Cherian and Mohendra Borthakur. Eminent physician Dr. Biswajit Baruah and senior musician Anupam Choudhury were also felicitated by the Nemcare authorities that evening. The cultural function began with the performance of an orchestra by noted Sarod player Tarun Kalita and artistes Abhinandan Das and Rupam Talukdar. The event was compered by Nayan Prasad and Jupitara Bhuyan. 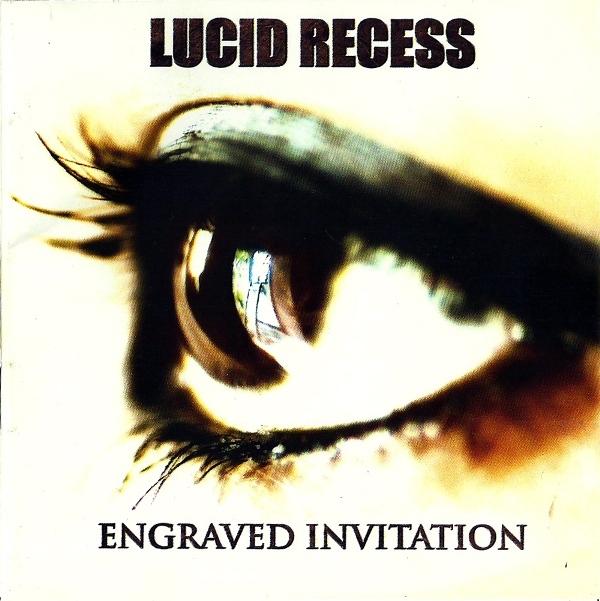 Lucid Recess recently launched its second album, Engraved Invitation, at a simple launch ceremony in Guwahati. But the album, which has been released under the LR Records label, is earning rave reviews all across the globe. Besides being testimony to the musical prowess of the band, the excellent recording quality, packaging and marketing of Engraved Invitation has come as a huge boost to the independent music industry of Northeast India, where the professional touch has been long felt. An alternative metal band, Lucid Recess is made up of brothers Siddharth and Amitabh Baroaah and drummer Partha Boro. The band was formed in the year 2004. The band member’s professionalism and attention to the smallest details, when coupled with their desire towards improvisation and self-improvement, have led to their emergence as one of the most loved alternative rock bands of the country. The band released their first seven-song EP, Carved, in 2007 and the same was widely circulated all over the country. Engraved Collection is a collection of twelve songs – all penned and composed by the brothers. Despite the varied influences that are reflected in all the songs, the album is held together by a powerful vocal performance. My favourite track in the album, however, would be the track, Calling, which has a beautiful piano intro. This album is a must for all lovers of alternative rock. A stunning confluence of modern and timeless Bollywood numbers mirroring the age-old traditions of Indian music rocked the Nehru Centre in London – the cultural wing of the Indian High Commission – last month. 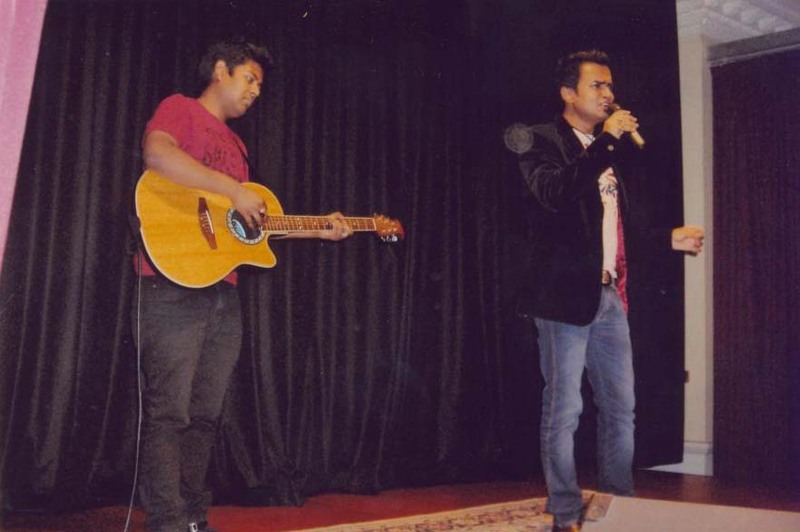 The reason was a stunning recital by Zee SaReGaMaPa 2005 winner Debojit Saha. Debojit was invited to Nehru Centre to perform as part of ‘Celebrate Assam’ – a month-long festival celebrating Assamese film, music and dance. The chief guests of the evening was Jitendra Kumar, First Secretary of the Indian High Commission – Consular & Community Affairs, Prem Modgill, President Hindu Cultural Saociety UK, Kailash Budhwar, BBC World Service, Usha Raje Saxena, Hindi Poetic Society UK, Khurshid Alam, Chairman, Progressive Muslim Forum UK, Saroj Taneja, Director Asian Art & Culture and Divya Mathur, Vatayan Poetry UK. An engineer by profession, Debojit started out as a singer in All India Radio and Doordarshan Kendra in Silchar. He created history by winning the Zee SaReGaMaPa challenge in 2005; the first such reality show contest to be won by a youth from Assam. He is married to Bandana Paul, who is a fashion designer by profession. A disciple of Pt Askaran Sharma, Debojit is now based in Mumbai. He released his first solo album after he reached the first runners-up position in the music contest, Ghazal-e-sara. With his disarming smile, Debojit says that his music takes him closer to divinity and accords to him peace and tranquillity. “It is an invigorating experience which exalts my spirits,” he says. Besides singing for Assamese and Bangla films, Debojit also anchors a Bangla music reality show. Thanks to the Nehru Centre, the recent UK tour proved to be a good opportunity for Debojit to showcase himself in front of the European crowd. His entire performance was covered by Zee TV UK and MATV UK. Radio 92FM had also arranged an interaction with Debojit, while senior journalist with BBC Manoshi Barua had also interviewed him. The cultural evening at the Nehru Centre began with Debojit singing a patriotic number, “Aye mere pyare Watan.” The number which brought the audience to tears was soon followed by “Jibone morone Moi Sirodin Asomiya”. 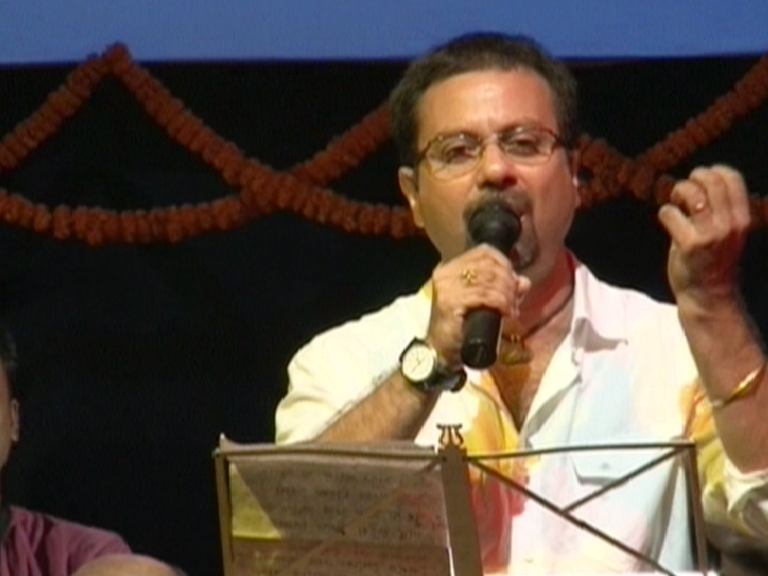 He also performed Bihu besides some popular numbers of Bollywood. Among all the art forms, music is supposed to be the greatest leveller, the healing and nurturing qualities of which never cease to amaze. The power of music is best evident in Northeast India, where lives have been torn apart by continuous violence and bloodshed brought about by insurgency and inter-communal clashes. Yet, as is the hallmark in the Northeast, despite all the violence and unrest music runs in the veins of each and every person residing here, binding them with its latent force and at the same time, healing the blistering wounds. This immense latent quality of music came to the fore once again in Assam’s North Cachar Hills district – the worst affected among all the districts of the State in terms of insurgency, communal bloodshed and corruption. The district, which is under the purview of an autonomous council, has been occupying news headlines in the regional media for the last few years on account of the unabated killings, extortions, kidnappings, blasts and inter-communal clashes that have resulted in thousands of lives being lost, families shattered and countless houses destroyed. For the people of NC Hills, life, filled with despair and despondency, has lost its charm; with the sole thrust being on survival. Thanks to the unifying force of music, however, attempts are now being made towards resurgence. 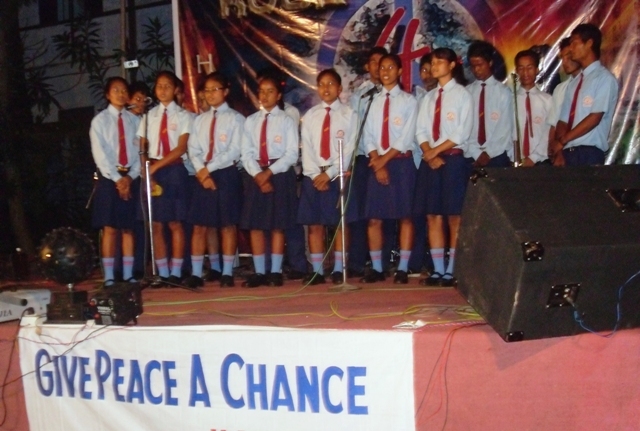 Haflong, the sole hill station of Assam and the financial capital of NC Hills district, recently witnessed a unique music concert aimed towards bringing peace and reconciliation among the various tribes and communities residing here. It was after eight years that Haflong, one of the most beautiful and exquisite locales in the entire Northeast, was witnessing a music concert. This is despite the fact that the district has produced some of the finest musicians in the Northeast. The aptly-termed peace concert was organized by the newly formed Haflong Music Association (HMA) – a forum of musicians and artistes seeking to revive the dying music scene in the district. The networking support to the event was provided by the Eastern Beats Music Society. HMA secretary Jivraj Daulagupu said that the basic objective behind holding the concert was to try and bring peace in the district and to also voice out the hopes and aspirations, as well as frustrations, of the youth and artistes. “Since 2002, when the clashes between the Karbi and Dimasa communities broke out, the entire area has been thrown under a security blanket even as clashes and untoward incidents have kept occurring at regular intervals. The concert is our attempt to provide a new vision to our youth.” HMA president Father Nilesh Parmar said that it was their dream to unite the people in the ever-volatile district through music that gave birth to the HMA. The peace concert was supposed to be held in Lal Field but the venue had to be finally shifted to the Cultural Hall in the middle of the town because of administrative inconveniences. The event, which saw Guwahati-based progressive rock band Digital Suicide sharing space with Soul Tree, Bistar, Sot Recho and Onion Trees – all local bands of Haflong – was a tremendous success, primarily because of the participation of all the tribes and communities. NC Hills is home to as many as 19 major tribes and communities, besides various sub-tribes; the Khelmas, Rongmei Nagas, Dimasas, Zeme Nagas, Karbis, Hrangkhawls, Biates, Hmars, Jaintias, Kukis and Vaipheis being the major ones. The evening began with a choir presentation by the students of a local school before the rockers took over the stage and enlivened the crowd, which had not witnessed a live performance for almost a decade. Even though rain tried to play spoilsport, the organizers had to bow down before the enthusiasm of the crowd and shift the venue from the open field to the adjoining cultural hall; that too, within the space of just half an hour! Father Tom Mangattuthazhe of the Diphu Diocese who was present at the venue with his team of peace activists said that the peace concert was live testimony to the power of music. “The latent quality of music, in all its forms, is truly amazing. The fact that it has managed to bring so many people, who are otherwise at loggerheads with each other, together is proof enough,” he said. If music can indeed usher in peace and development and bring cheer to people’s lives, I would just say: Let the music play on! Oslo, last week, woke up to the grandeur of Ratan Thiyam and his famed theatre group. The entire troupe of the Chorus Repertory Theatre led by Ratan Thiyam himself staged ‘Ashibagee Eshei’ (Song of the Dead) at the international Ibsen festival 2010 last Wednesday and Thursday. With the staging of the play, Thiyam has once again done the entire Northeast and country proud as ‘Ashibagee Eshei’ was the only play to have been invited from India. 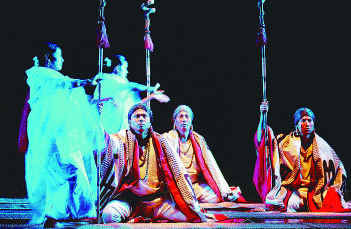 ‘Ashibagee Eshei’ had been first performed at the Delhi Ibsen Festival in 2008. Following the staging of this play, the praises are yet to stop pouring in; with even The New York Times waking up to the maestro’s achievement.. The Chorus Repertory Theatre is today acknowledged throughout the world for the successful blending of Eastern and Western art forms. When contacted, Thiyam’s answer to the praise was a simple “Ibsen wrote an unlimited play”. At a time when classic rock is slowly disappeared from the country’s music scene, a new star has arrived in the form of Girish Pradhan and the Chronicles. Within a very short span of time, Girish and his troupe from Gangtok has caught the fancy of rock lovers of the country, primarily on the strength of Girish’s vocal prowess and terrific chemistry between the band members, besides their skill of course. Girish had earlier performed at the Suncan International festival earlier this year and done the country proud by winning the first runners-up position. The band will be performing in the city on Sunday as part of the Rockarolla Pub Rock fest at Blues lounge. A few other bands from the city and the Northeast are also slated to perform the same day.